This was my first time trying freezer paper piecing, but I think I could do more, now I’ve got the hang of it. Rather than remove the freezer paper (that had been predrawn and sent to us with seam allowance included), I drew the seam allowance onto it and just stitched through the paper. Ayumi’s original tutorial had you remove the paper and draw the seam allowances onto the fabric, but I think I’ve seen others cut the freezer paper without seam allowance to start with, then add on the SA with the fabric, and just leave the freezer paper on while sewing, so I kind of did the best combo I could (given that I didn’t have the original lines of the pattern to work with). So you may have noticed that mine is the complete reverse of Ayumi’s. Yeah, that would be because I didn’t see the bit where she irons the paper to the front of the fabric, not the back – oops! My next problem came because things didn’t seem to be lining up right on the spout side and I just could not work out why. Now when the pattern came through, Alli said she’d blown it up by 150%. Can you see where this is going? Err, yeah, I didn’t until I got all the spout pieces on. If you’re shouting at the screen ‘The seam allowance also went up by 150%, making it 3/8″ ‘ then you get a gold star. If not, then, hey, I’m in good company! Anywho, brute force, ignorance and a bit of trimming and we had a teapot. Hope this works for you Alli! Now I have to tackle a new pet, Carl. Carl is the kind of pet I can give houseroom to all day, no feeding, no cleanup, no nothing, would you like to meet him? Here he is from Joanna’s blog, and I’m pattern testing him tonight for her. I would never have thought to increase the seam allowance in 100 years and am still sort of left wondering why because I am thick like that. Errr to be honest I'd have been in a total mess with that top block… Good luck with the scaley dude! I'm loving Carl! 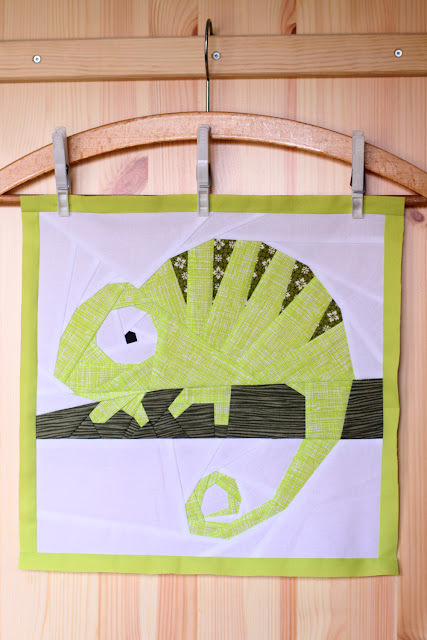 There is something about paper piecing and animals – they just go hand in hand. Happy Friday! lol … what a great post … the ups and downs … do non-stitchers have any idea of the hand-eye co-ordination and particle physics we put ourselves through?? I love the chamaeleon .. I've always wanted one! Can't wait to see more ..
Too much brain work required for a Friday night for that teapot block, you are a better woman than me! Like your scaly friend too, just the thing to frighten small animals and children! Oh no! I'm sorry it was frustrating — I had meant to save you trouble by sending the pattern pieces already traced out. Ayumi's original pattern actually didn't have the seam allowances in it (it's a chopped-up picture of a tea kettle); I cut those all out and then added the 1/4" seam allowances when I was tracing them on the freezer paper. Maybe the trouble was that I wasn't precise enough about the seam allowance I was adding. How cute! 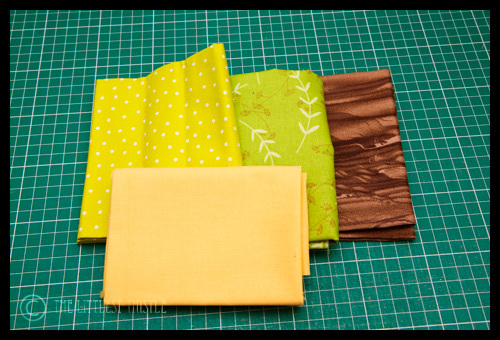 Sorry to hear about your whoopsies – I tend to make a lot I them late at night when I'm trying to finish a project! I love Carl!! Hope those oopsies are nothing to do with that late might last night? We have the same problem with Bear patterns. Always cut off the seam allowance then put it back on the the blown up pattern. I would never have thought to change the seam allowance but now it makes sense after reading Kays Kids comment. Wow that chameleon looks fabulous, can't wait to see yours. Take care now and have a good weekend. Is it just me, or is that teapot kind of Dalek-esque? Carl is gorgeous, have fun! You're in good company…. heheh .. I'm in love with Carl. Can't wait to see your version. Oh crap, I'd have never figured it out either! 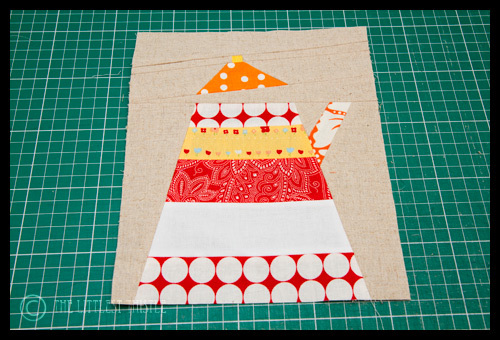 I think I'll stick to the foundation pieced teacup instead… but yours looks totally awesome! well done! Love Carl, looks just like my kind of lizard. I can't wait to see him in the fabrics you chose. I really like the colors. That is a very cute teapot, but the cameleon is perfect and so technical.